When they rot right through? When they fall on you? Another year, another stupid costume for Karvel Kon! And yes, we sang the song with the actual Cops theme music. If you’ve not heard of the Cops TV show, then this costume probably doesn’t make any sense whatsoever. On the other hand, if you have heard of the Cops TV show, it probably doesn’t help a lot. Camouflage clothing is usually quite expensive, and we started with Goodwill, but ended up in Walmart. Anna has an app that looks up the actual price of things in their system vs. the marked price. I was pretty dubious, but the trousers were listed for about $12.00, but were actually on sale for $6.00, and the hoodies were listed as $28, and were really only $5.00! 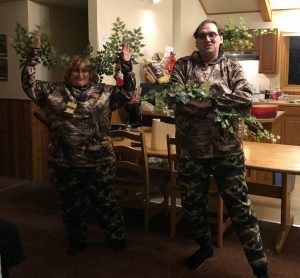 We ended up spending more on the fake tree branches than on the clothes (Anna has claimed the trousers for pajamas, and the tops for use when clearing snow, so they live on). The font is called Due Date. Anna cut out the letters using her Silhouette Cameo Electronic Cutting Machine. In theory, she could have taken the image as a file, but it ended up being easier to just scan a printout and then have the machine cut it out of sticky vinyl. 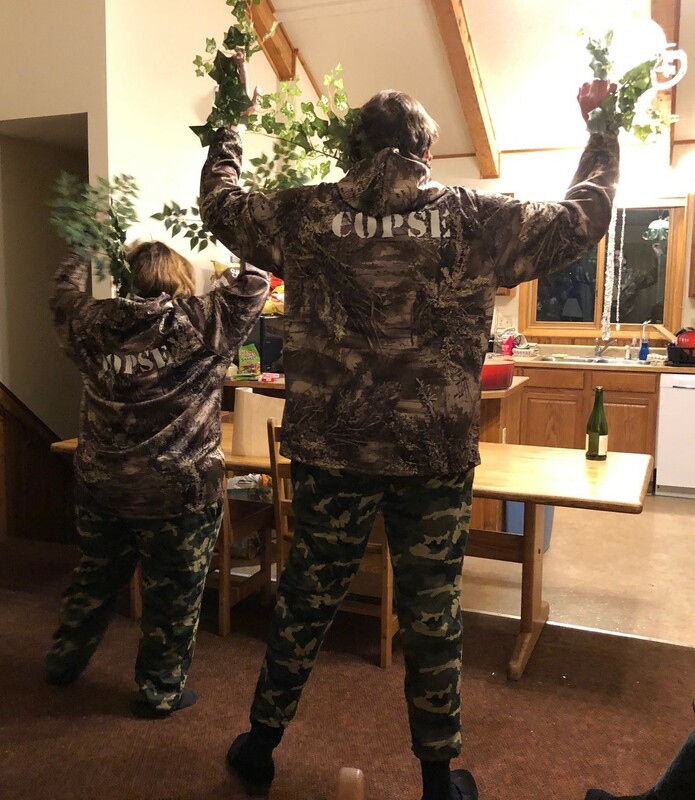 We had a little problem with the loose pieces of the C and the E coming off, so had to be a bit careful moving around–we could have applied the letters in a more permanent manner, but Anna wanted to be able to reuse the outfits later. The bird house was a dollar at the craft store. 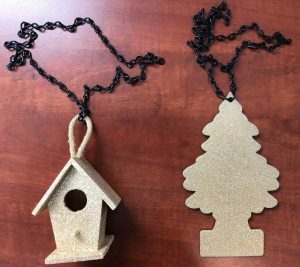 I 3D-printed the air freshener. Then we just spray-painted them both with a metric-ton of glittery-gold spray-paint. The black chain came from the hardware store (they didn’t have gold). Anna thinks I should hang the air freshener from the mirror in my car.